Main Street, Vancouver, runs down the center of Mount Pleasant, and is often jokingly referred to as “Hipster Central” due to high clusters of easily recognizable bearded and flannel-clad creative/tech/slacker types. When the Group of Seven were painting expressionist versions of the Canadian wilderness, the American regionalists depicted pastoral life with a stylized serenity that was decidedly not present during the 1930’s Great Depression. Regionalist Grant Wood is best known for his iconic “American Gothic” portrait but I love his serene landscapes with swirly hills and curved country roads the most. Most of the American Regionalists painted similar rural scenes—idealized but often with a hint of darkness. These romantic views of self-sufficient country life were painted as how they probably wished it was. This is a painting of Vancouver’s Main Street painted in the manner of American Regionalists but with the expressionist brush strokes of Group of Seven—because I realized, mid-painting, that it is hard to change one’s default style. Nonetheless, my idealization is clear: this is how I wish it was and not how it actually is. I’ve taken a lot of buildings out and have given it a winding country-style road. 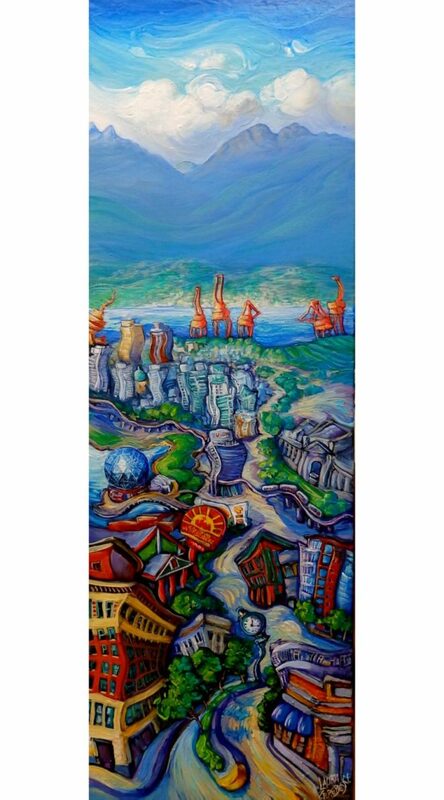 I included the landmarks I like and consider iconic, like Mount Pleasant’s signature “pocketwatch” sign, the train station facing the Science World globe, and a bank that doesn’t have loan-sharky Cash Money signage. The omnipresent cranes look like playful birdlike bathers and there is an upward trajectory in the sea, the mountains, and the sky. Main Street and neighboring streets have about a dozen high-rise condo developments in various stages right now. Vancouver has the most expensive real estate in North America (second in the world) and thus needs more “densification” to create more available “product”. Densification is the official City Hall term but what it means is that more of us can fit into this desirable landscape. Problem is, most of “us” can’t afford Main Street anymore and densification tends to make everything more crowded, traffic-snarly, and irritable. I chose a tall, narrow canvas because I wanted the viewer to start at the bottom and look up, way up, and remember what is beautiful here. Buildings are always transient points of familiarity but the sea and mountains and sky remain the same.